I met Ms. Bruce in a studio that looks more like a construction site than an artist’s studio, in one of Chicago’s many industrial lofts. Her sculptures rose vertically from the wooden floor, dotting the space as piles of material rounded the interior. Bruce’s process is founded in her training as a painter but has since expanded off the wall and into the exhibition space. She retains an acute understanding of composition and color while exploring the sculptural and “architectural” possibilities available in this expanded mode of production. Her sculptural works, comprised of found, collected and sometimes personally meaningful objects are assembled to strike a delicate balance, both physically and aesthetically. Some of her works look as if they are about to collapse altogether yet they remain, secured in various ways. “I like gravity,” she states whimsically. An interesting contrast is struck in her work, between the rough state of her materials and the delicate installation and assembly of her works. When asked about the critical aspect of her process, she replies that she is “critical of the hand. Bringing awareness and possibility back to the hand and the physical manipulation and engagement with things to bring change.” As she “grapples” with the objects that make up her work, she brings attention to the materiality of the shards that remain from the activity of our contemporary civilization. Her process is physical, using mostly hand tools whenever possible. This physicality of process is apparent in her work. Wooden edges are left unfinished; Plexiglas scratched from moving and storage remains untouched and even paint-fingerprints dot some of the works, evidence of the artist’s hand in crafting the work. 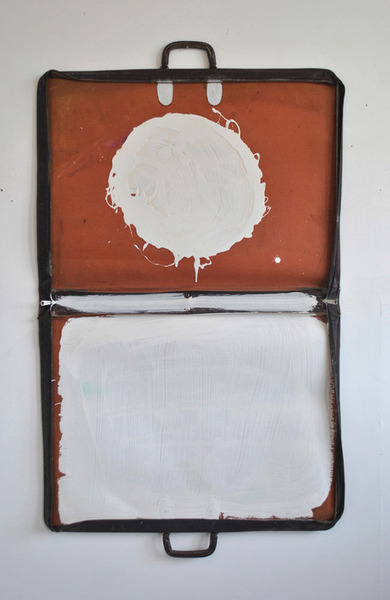 Veronica Bruce, Spin and Hover, 2012 , old portfolio case from Gary Drake, white interior latex paint, nail , 53 in by 32 in by 1 in. ; © Veronica Bruce. Bruce’s work is a practice in transubstantiation. By emptying an object of its emotional and practical content, it allows itself to be filled, again, by the needs of the viewer. “My work is full of this transformational quality, how I alter them, I bring them up. They are reflective of a need to change and reflective of a need to be positive with circumstance." Veronica Bruce is a painter, sculptor and arts educator based in Chicago. Her sculptures, paintings, and installations make use of everyday materials. They take on a construction zone feeling of labor, building, structure, intermixed with a spontaneous sense of arrangement and fragility. Bruce received her BFA from the University of Illinois in Urbana – Champaign in 2004 and completed a Master of Fine Arts in Painting from the University of the Arts in Philadelphia in 2011. Solo exhibitions include Julius Caesar, Chicago in 2011 and the Hinsdale Public Library in 2012. Her work has been included in group shows at Robert Bills Contemporary, The Nevica Project, Park Schreck Gallery, and with curators Casa Duno in Chicago. Artist residencies include threewalls Chicago in January 2012 and Bundanon Trust in New South Wales, Australia in March 2012. Veronica looks forward to traveling to Lithuania this upcoming May 2013 to participate in an artist residency at NIDA Art Colony in Nida, Lithuania. Her work was recently acquired by DePaul University for the Arts and Letters Hall.